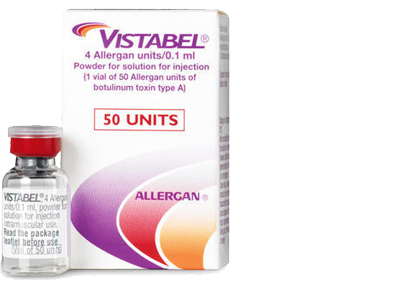 Vistabel is a botulinum toxin type-A (onabotulinumtoxinA) for cosmetic use in non-surgical procedures. Vistabel is made from purified type- A neurotoxin produced by the bacteria Clostridium botulinum which temporary blocks the nerve terminals. Vistabel is indicated for the temporary improvement in the appearance of moderate to severe vertical lines between the eyebrows seen at maximum frown (glabellar lines), moderate to severe lateral canthal lines (crow’s feet lines) and moderate to severe forehead lines seen at maximum eyebrow elevation. 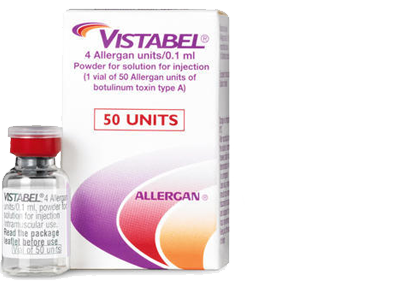 Vistabel may also be used for excessive sweating, muscle spasm control and chronic migraine.